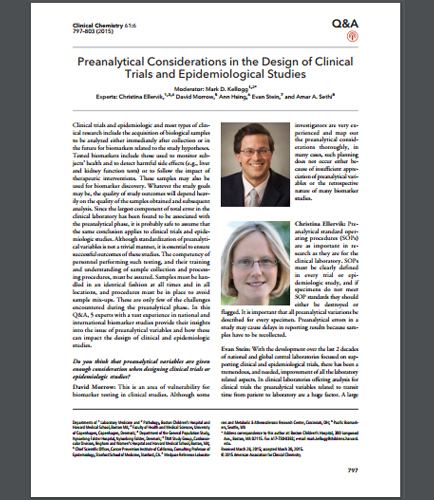 "Pre-analytical Considerations in the Design of Clinical Trials"
Preanalytical considerations in the design of clinical trials and epidemiologic studies are the cornerstones of the biochemical analyses. The main subject of clinical study design and epidemiology research is to monitor health, detect the harmful side effects and study the impact of therapeutic interventions. However, the largest contribution of errors in the clinical study design and epidemiology is associated with preanalytical phase. Do you think preanalytical variables are given sufficient consideration when designing clinical trials or epidemiologic studies? Is there a technology or a process to improve stability of sample analytes so that future investigations will not suffer from poor sample quality? What are the common challenges encountered during the preanalytical phase? Availability of limited resources during the clinical designing. Technology and storage processes used to store the biomarker samples. Time elapsed between the sample collection and the stabilizing agents used to store the samples. Download this whitepaper with a brief insight into the issues of preanalytical variables and how they impact the clinical trial design and epidemiologic studies.